Man charged for assaulting black Trump protester. Cameraman: Did you like the event? McGraw: You bet I liked it. C: What did you like about it? M: Knocking the hell out of that big mouth…We don’t know who he is, but we know he’s not acting like an American. C: So he deserved it? M: Every bit of it. M: Yes, he deserved it. The next time we see him, we might have to kill him. We don’t know who he is. He might be with a terrorist organization. 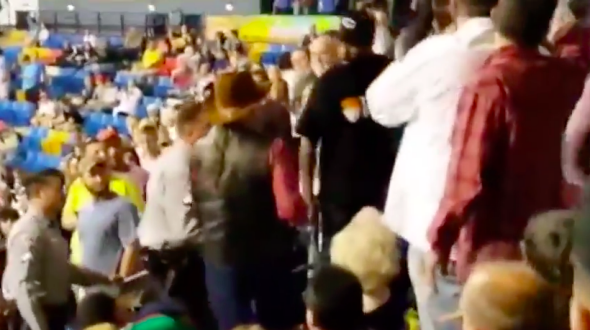 John McGraw, 78, of Linden, has been charged with assault and battery and disorderly conduct after authorities say he assaulted a protester who was removed from Wednesday night’s Donald Trump rally at Crown Coliseum in Fayetteville. The man who was punched, 26-year-old Rakeem Jones, spoke to the Washington Post about the incident and does not appear to have been seriously injured.